When Yan Yan is damaged, the person who hurt him gets an Archer Coin. 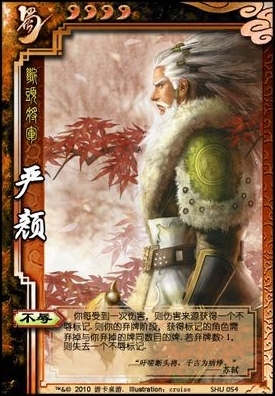 During Yan Yan's discard phase, every player with at least one Archer Coin must discard the same amount of cards. If the amount is greater than one, that player loses an Archer Coin. It is possible for players to accumulate more than one Archer Coin at a time. When they are forced to discard more than 1 card they will only lose one Archer Coin though. When the players are forced to discard, they have to option of discarding equipped cards as well as from their hand. If they still do not have enough cards, they lose everything.